(Newser) – At $3.1 million it's kinda pricey—but hey, it's bluefin tuna. 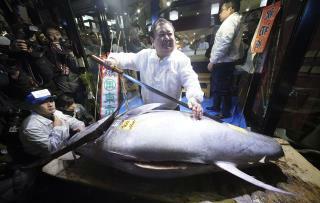 The owner of a Japanese sushi chain made history Saturday by dishing out the highest-ever sum for a single fish at the new year's auction of a Tokyo fish market, CNBC reports. "I bought a good tuna," Kiyoshi Kimura told the Japan Times after buying the 613-pound fish at the new Toyosu market, but... "I think I did too much. I expected it would be between 30 million and 50 million yen, or 60 million yen at the highest, but it ended up five times more." Higher than originally thought, indeed: Paying roughly $5,000 a pound when the highest rate is usually $40 a pound is a bit of a markup, notes the AP. But the Atlantic reported in 2014 that it's great publicity to win the first tuna auction of the year. Wow,throwing away money for bragging rights.Must be Japans version of a Democrat. North American Fisheries Organizations & NAAFE have been setting limits on many different migratory fisheries, for decades. And it works particularly well when it is NOT a migratory fishery, like Sturgeon. However, OTHER countries observe no such limitations and are making migratory species extinct when they are out of our waters. We can thank Japan and their "research" for the peril of many whale species, as well as the endangered Blue-fin tuna. Meanwhile China encourages their private companies to ignore international fishing boundaries and use dredge techniques that scoop up 60 percent more fish than they can use and kill whole ecosystems. I can't believe I'll have to explain to my kids what polar bears, monarch butterflies, and tuna were; like the dinosaurs.